West Bank—Sana Al-Sayeh started her business selling sweets about 12 years ago. In the past year, applying new marketing techniques nearly quadrupled her monthly profits from 80 dollars to 300 dollars. Growing up learning the art of making cakes, chocolates and other sweets from her grandmother, Sana established Sana Sweets in 2003. Although she had a substantial client base through word of mouth, she struggled to fill her daily orders and lacked the necessary equipment to maximize her products. The Near East Foundation (NEF) has helped more than 200 women entrepreneurs like Sana grow their businesses through a three-year program to advance women’s entrepreneurship in the Palestinian Territories. NEF project director, Hiba Hamza, explains that women play a key role in the Palestinian economy. However, limited opportunities to engage business associations greatly hinder their ability to launch and sustain viable businesses. In collaboration with the Cherie Blair Foundation for Women, NEF focuses on the “missing middle” of women entrepreneurs—women with existing businesses ready to be taken to scale, with the potential to revitalize the Palestinian economy and trigger positive social change. NEF’s training, coaching, and product development workshops helped Sana to grow her business and obtain loans to buy needed equipment and materials to meet demand. NEF’s program advisors and mentors helped her market her brand by developing a new logo and packaging, and investing in promotional photos to advertise her products. Samaher Romi is another participant. She lives in a refugee camp in Hebron and decided to take a creative yet eco-friendly approach to her business: producing and designing chairs out of recycled car tires. However, when Samaher first began her business she faced challenges that plague many women entrepreneurs in the region such as limited access to financial services and a culture that is not always accepting of women with ‘nontraditional feminine businesses’. With grants and loans available through NEF’s project, Samaher expanded her furniture business by drumming up demand and therefore increasing production and profits. Another participant, Amal Kharma, transformed her home-based side business preparing food into a fully functioning cafeteria. Her business began as a way to bring in additional income by selling baked goods to relatives and neighbors. Unbeknownst to her, she was actually losing money on many of her orders because she priced her goods too low. Through NEF’s program, Amal gained the business and marketing knowledge necessary to confidently establish new prices and make other business decisions that would result in an increase in profits of nearly 60 percent. Like Sana and Samaher, NEF also trained Amal on how to brand her products and promote them through social media. With her increased profits, Amal has expanded her business from solely pastries to include jams, pickles, and traditional Palestinian dishes. After their experience with the program, all three women have gone on to train other women in their communities and refugee camps. 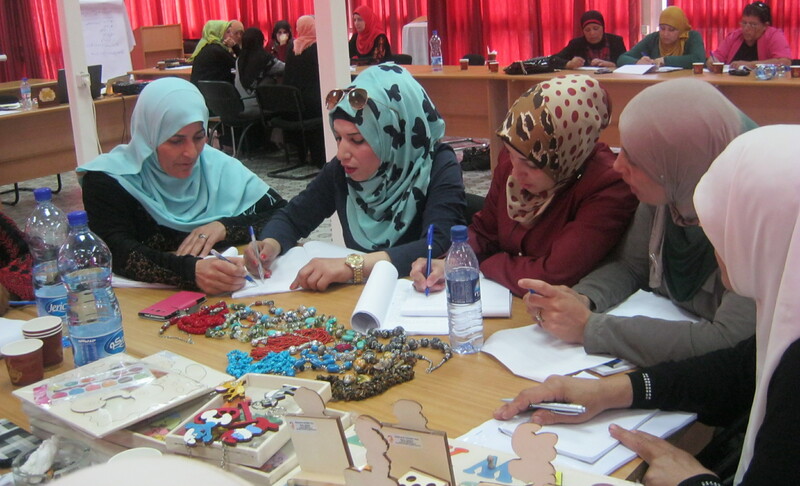 The Advancing Women’s Business in Palestine (AWBP) project is implemented by NEF in partnership with the Cherie Blair Foundation for Women, with support from the Trafigura Foundation and Oak Foundation. Read more about AWBP and NEF’s work in the Palestinian Territories.